Pharma Tren 50 is a steroid, previously widely used in veterinary medicine for a significant increase in the weight of cattle. In fact, with the introduction, in a short time, animals could experience an increase in the mass of high-quality, clean meat by 50-80 kg. Later, scientists, by esterification, created several forms of the drug, which at certain dosages could bring significant results in the physical development of a person without causing any special harm to the body. Thus, the most powerful anabolic steroid was produced, which due to its unique properties, gained popularity in many sports, in particular bodybuilding. The chemical structure of trenbolone is similar to one of the most popular anabolic steroids belonging to the group of highly androgenic substances, nandrolone, they both have a class of 19-norsteroids. However, there are some differences, the steroid structure of parabolan does not allow for the initiation of aromatization of androgens to estrogen, even in case of excess of the first, so we have a drug that at normal dosages can significantly increase the muscle mass of an athlete, while not retaining fluid in the muscles accumulate fat, and increase the power and strength characteristics of the muscles. 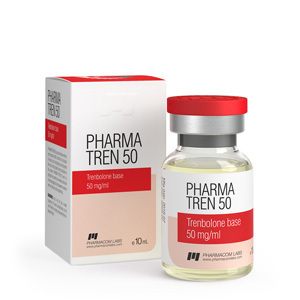 Pharma Tren 50 course, as a rule, consists of several drugs, in addition to testosterone, it can be – Methandrostenolone or Turinabol. Injections are made every 3-4 days, it is very important to maintain an even period of time between injections, do not do injections too often, the results will not increase, however, at high dosages undesirable effects such as acne, hair loss on the faceplate, or excessive hair growth on the chest, face, arms and legs. The cycle, as a rule, lasts for 3-4 weeks, after which a break is taken for at least 2 months with the intake of testosterone stimulants such as Tribulus or Gonadotropin.